website) from which it operates, is owned and operated by Scissor Stitch. 1.3 In the course of your purchasing from our Online Shop you confirm your acceptance of these terms. 2.1 We make every effort to be as accurate as possible in the Product descriptions and prices. webpage in the Product details. 3. How the contract is formed between you and us. confirms our acceptance of your offer to purchase the Products. 3.2 The Contract will relate only to those Products indicated in the acknowledgement email. the Products in accordance with our refunds policy (set out in section 8 below). care of the Products while they are in your possession. If you fail to comply with thisobligation, we may have a legal right to claim compensation from you. 6.1 We aim to process and ship your order within 14 working days of confirming your order. Scissor Stitch at enquiries@scissorstitch.co.uk, or by telephone on +44(0)121 453 0400.
amount due as listed on our delivery charges page. which we have already sent you an acknowledgement email. unmistakeable and could have reasonably been recognised by you as a mispricing. or debit card until we despatch your order. returning the item to us. your refund via email within a reasonable period of time. the postage cost incurred by you in returning the item to us. used by you to pay for your purchase. limited to the purchase price of the Product you purchased. example) loss of profits, revenue, contracts, data or goodwill. contact your local customs office for further information before placing your order. country for which the products are destined. We will not be liable if you break any such laws. such communications be in writing. This section does not affect your statutory rights. 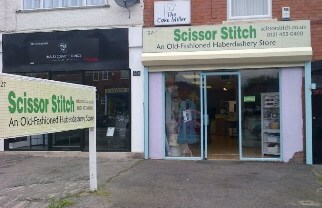 All notices given by you to us must be given to Scissor Stitch at 127, New Road, Rubery, Birmingham or by email to enquiries@scissorstitch.co.uk. sent to the specified email address of the addressee. or public or private telecommunications networks or the threat of any of these things. obligations under the Contract may be performed despite the Force Majeure Event. you may not do so without our prior written consent. waiver by us of those rights. enforceability of any other part. relation to the subject matter of any Contract. whole agreement between you and us. authority (in which case it may apply to orders previously placed by you). residence or any other relevant country.